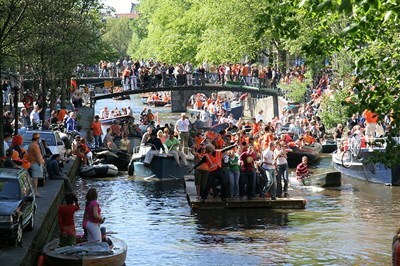 Koningsdag (Dutch pronunciation: [ˈkoːnɪŋsˌdɑx]) or King's Day is a national holiday in the Kingdom of the Netherlands. Celebrated on 27 April (26 April if the 27th is a Sunday), the date marks the birth of King Willem-Alexander. This description uses material from the Wikipedia article on Koningsdag and is licensed under the Creative Commons Attribution-ShareAlike License (view authors).